Now you can have an all-inclusive calendar that matches whatever year you need! The Any Year Flexible Calendar is a great way for you to organize everything you have planned for the year to fit around your unique lifestyle and busy schedule. Customizing the dates and years is as simple as selecting the month and year from a drop-down menu. Download the free file below to get started personalizing your own Flexible Calendar! To get started, you’ll first need to click the link provided at the bottom of this page to download the free file containing the calendar. You will begin on the “Select Calendar Date” tab. Here you will select the year and month you want to start simply by clicking on the down arrow next to each selection then choosing the date you want to begin. After you have successfully chosen the start date you want, the template will automatically format the other 12 tabs to the corresponding months. Now you can click on the “month 1” tab to start entering your events and reminders for the year. All 12 months are available in each of the tabs starting with the month you selected in the first tab. If you want to print any of these months simply press the “File” button at the top of your screen and select “Print” from the drop-down menu. 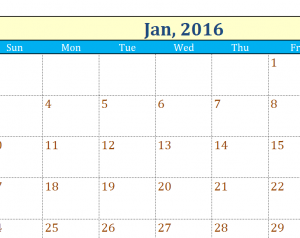 Why Should You Use the Any Year Flexible Calendar? Organizing your schedule is important for any busy person. There are so many things that just slip by people because they had no way of reminding themselves. The Flexible Calendar is a clean way to organize your events and dates and display them each month as you go. Never let a single moment pass you by with this amazing calendar.